A continuation of Susan Wise Bauer’s narrative history of the world, from the aftermath of the First Crusade to the Capture of Constantinople. Save $5 off the cover price by purchasing from us! This volume chronicles the contradictions of a world in transition. Popes continue to preach crusade, but the hope of a Christian empire comes to a bloody end on the walls of Constantinople. Aristotelian logic and Greek rationality blossom while the Inquisition gathers strength. Kings and emperors continue to insist on their divine rights, but ordinary people all over the world seize power. New currencies are created, new weapons invented, and world-changing catastrophes alter the landscape: the Little Ice Age and the Great Famine kill millions, the Black Death millions more. In the chaos of these events, our own world begins to take shape. Follow the story back; check out the History of the Medieval World and the History of the Ancient World! Another expertly clarified primer by Bauer (History/Coll. of William & Mary; The History of the Medieval World, 2010, etc.) organizes by themes the chaos of the medieval world into a semblance of cohesive law, migratory logic and religious fervor that would later explode into the Renaissance. The author has an excellent eye for presenting her subject in bold strokes, memorable themes and without undue clutter. Her work is grounded in the notion of the Renaissance (or, as she posits in the plural: renaissances) as gaining seismic steam in the 12th century, with translation of classic texts by Gerard of Cremona and others. The debate between reason and faith was engaged, proving hugely subversive to central powers. The violent, epic thrusts of peoples also marked the period: The Crusades were launched by the Byzantine emperor in Constantinople; the Muslim kingdoms battled to capture the Spanish peninsula, spreading into Africa and northern India; England and France dissolved into frequent anarchy and civil war, leading to the rise of the Plantagenets; roiling ensued in the Hindu and Buddhist kingdoms of Sri Lanka and India; the shoguns ruled in Japan, the Ming in China; great empires like the Incas and later Aztecs rose in South and Central America; and the Mongols galvanized their ferocious military might and set their sights to the west and south. This was the era of Genghis Khan, Frederick Barbarossa, Saladin, Richard the Lionheart, Osman, Robert Bruce and Mansa Musa of Mali, as well as the Magna Carta, Inquisition, the plague and the spread of the Portuguese slave trade into Africa. 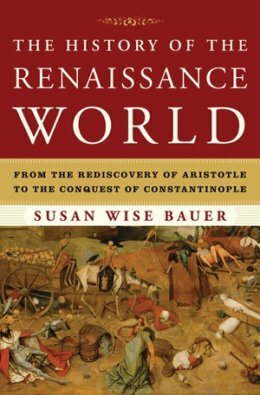 Already splintered, Byzantium would be eclipsed by the Turkish conquest of Constantinople in 1453, provoking new exoduses of peoples, west and east, “the seeds of new nations; the roots of new wars.” Bauer ably captures it all. A wide-angle, thorough world survey for students, complete with immensely useful timelines and maps. Will you be writing a Modern World book, as well?